NWHikers.net - View topic - WA Governor Inslee running a campaign based on fighting Global Climate Change. Forum Index > Stewardship > WA Governor Inslee running a campaign based on fighting Global Climate Change. Lets hope he doesn't become that!! We are the first generation to feel the sting of climate change, and we are the last generation that can do something about it. It's a catchy phrase, but not technically accurate. No matter how bad climate change gets, we will always be able to do something about it. We won't be able to prevent it, but it's already too late for that anyway. And for those who doubt we are feeling a sting, see my post from earlier today in the regular GW thread for just one piece of that pie. Borrowing this section of MGs post since it fits my first impressions of Inslee. He lost me when the Washington State Patrol security detail budget was released, and his campaign said 'cool' and kept trucking along. Then the WSP budget nearly doubled in anticipation of more security needs ($ grab?) and I learned of the $400K spent in 2017 when he wanted to practice for 2019's presidential bid. Hope someone is happy with that cash. I see a candidate who is comfortable with the established model of greasy wheels. It seems to me a Washingtonian like Gary Locke would be far more qualified to seek higher office than the current seeker--aka Jay Inslee--who seems to be more of a life-long political opportunist. In any event, he's wasting both his time and ours. "The recent, tragic death of the orca calf is heartbreaking and we all feel the pain of the mother and her pod. Protecting and restoring the complex ecosystem these beautiful animals rely on will take a lot of work. There are no do-overs with the orcas. 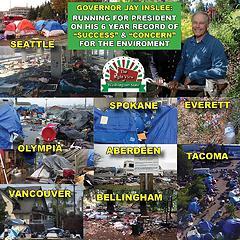 We must get this right"
I did a Google image search & a YouTube video search for Jay Inslee on a whale watching tour. I can't find anything. I'd like to know if he's ever been on a tour. I agree with Brian R's comment re Gary Locke, but can't say more w/o seriously violating our terms of service.